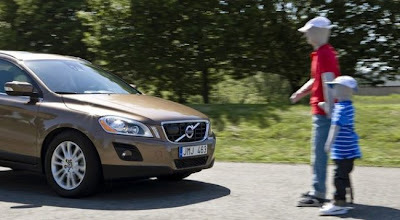 Volvo is wrapping up testing their new - and clumsily named - Collision Warning with Full Auto Brake and Pedestrian Detection to be included as extra gear in their new S60 model. What that means is that the car is designed to detect pedestrians and a prototype has been driving around Copenhagen to 'train' the system. It is meant to spot all pedestrians in front of the car as well as off to the sides in a 60 degree angle. It will warn the driver with a red flashing light on the windshield if the car is on a collision course with a pedestrian. If the driver doesn't react quick enough it will brake automatically up to 25 km/h and stop by itself if the car is travelling under 25 km/h. Copenhagen was chosen as a test city because we have a lot of pedestrians. The test car's screen shows pedestrians popping up. Sometimes cyclists show up but urban inventory like trees and posts don't register. The Danish daily newspaper Politiken took a test drive and they asked why cyclists weren't included. Volvo replied that they are taking it one step at a time. "Cyclists will perhaps be next on the list, and then animals. It is very complicated to teach the system to read pedestrians' form and structure and separate them from other objects. Because it's just as important to not send false warnings as it is to register pedestrians. If the system beeps, warns and brakes too often, the driver will tire of it and shut it down", said Martin Magnusson from Volvo. Therefore the system developers have been all around the world for months in order to teach the system to recognize all the different kinds of pedestrians and to learn different weather and light conditions. The system doesn't work at night. The development of this system has taken 10 years. Pedestrians were chosen first because 16% of all traffic related deaths in Sweden are pedestrians and 11% of all serious injuries in accidents are pedestrians. They are the high risk group. The speed is under 25 km/h in half of these accidents which is why a total automatic stop will have an enormous effect. And a reduction of speed from 50 to 25 km/h will reduce the risk of death by 85%. "A completely concentrated and sharp driver is always the best option, and better than this system. But research into a long list of collisions show that the driver was occupied with something else other than driving in 93% of the accidents. And half - 47% - didn't even have time to react because of the distration. This is where our safety system comes into play", said Jonas Tisell, who heads the project for Volvo. So this sounds like somebody who is not actually ignoring the Bull in Society's China Shop. The idea sounds interesting. Not unlike the Dutch project to place airbags on the outside of cars [which is so far developed that crash test dummy tests are scheduled for later this year]. There is the chance that drivers will be lulled into yet another false sense of security by this system. John Adams, Emeritus Professor of Geography at University College London has an excellent blog called Risk in a Hypermobile World where he, among other things, questions the hype about the effectiveness of seat belts. What say you all? Good idea this Volvo thing? Or not?